Last night, I was reading some books with the kids. My 6 year old daughter left and I didn't think much of it. She was calling from the kitchen table, "how do you spell 'could?' I was telling her how to spell it, she couldn't hear me, so of course each time got louder and more agitated. Gulp. She didn't even finish. And she was already asleep. I just wanted to cry. I get guilty mom of the day award. Don't you just wish you could push the rewind button somedays, and then re-record?? Oh, what a sweetie! I think about rewinding quite a bit. I wish I could keep better control and have more patience. Shame on you for making me cry! You have done a great job raising your children, a big part of why they are so sweet! Our RS lesson was on Elder Ballard's talk from last conference, so this must be a lesson I need reminding of, so thank you...I will try to do a little bit better as a mother! Tell Hailey we love her (and Lauren, Logan, and Spencer too)! I absolutely wish there were days I could rewind because I screwed up. 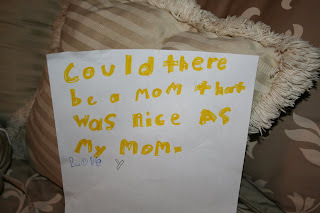 And then there are days that I spend wondering if I am doing the right thing with my daughter (regarding discipline mostly) and I rewind the day in my head wondering if I should have done something differently. Parenting has so many question marks, but thank God, so many new days when His mercies are new every morning! sweet Hailey!!! And you are a good mom! Don't beat yourself up! I know she loves you just the same! And...kids are pretty forgiving don't you know! Especially MINE! Egads! I am always doing DUMB stuff that I have to ask them to forgive me for! sniff sniff!!! Hugs to Hailey and MOM!!! Oh Melissa. . .how I miss you and your sweet family. You have been a great example to me of righteous motherhood and I am grateful to you for that. I hate when I screw up during the day. I hate that sinking feeling in my heart when I know I should have done something different. Sometimes all the advice and reminders just don't cut it for me- I still feel bad, but I know that is Heavenly Father's way of nudging me to do better- to always try a little harder and then maybe, just maybe next time I will- even though I usually don't. . .I think you are a superstar. I recently took up journaling online- so I'm excited to see what you are up to!! Ahhh how sweet of her! I am guilty of the same things and sometimes on esp hard days want to go in at 10pm and crawl in bed with my sweet girly and hold her and cry. I don't of course, because I don't want her to wake up, but I do think about it. How cute is Hailey! I don't know what else to say - she is so sweet. Give her a big hug for me and don't feel bad.